The Posts module is the nonanimated version of the three Posts modules (Posts, Posts Slider, Posts Carousel), and it has the most versatility with layouts, settings, and content filters. Tip: Not sure which Posts module to choose? See examples of all three Posts modules and layouts. Layout Columns: Posts are displayed in top-aligned rows. Title, metadata, and content appear under featured image. Columns layout lets you choose number of columns. Masonry: Posts are displayed in columns but vertical spacing is fit to the height of the post (unless the equal heights setting is selected). Masonry layout lets you choose the width of each post in pixels. Gallery: Post title and metadata are overlaid on the featured image and displayed on mouseover. There is no option to display content. if there is no featured image, an image icon is displayed. Gallery layout offers no options to set number of columns or post width. List: The posts are listed vertically in a single column. Enables the use of custom HTML to display the posts. Though this field requires Beaver Themer, you can create custom layouts both in Themer layouts and in a Posts module that you add to the content area of a regular page. For example, you can use a custom layout to provide a fallback image if the featured image isn't present or you can display custom fields. Creates a border box of equal height around each post. The border box is sized to fit the post of greatest height in the display. Tip: Setting Equal heights to Yes for the Masonry layout changes the masonry appearance to look like the Columns layout. The major difference is that you set width of each box in Masonry layout and number of columns in Columns layout. Maximum number of columns in each layer. Readjusts automatically as screen size grows smaller. Clicking the icon next to this field shows the responsive posts display for large, medium, and small devices. Post spacing Distance between post border boxes horizontally and vertically, in pixels. The Post spacing value does not affect the spacing above the top layer of posts, but it does affect the spacing below the bottom layer of posts. Post padding Distance between a post's border and its text (the post title, metadata, and content). The featured image is not affected by this setting, so if there is a featured image the upper post padding occurs between the featured image and the post text. Post alignment Alignment of text for post title, post info, and content. The Default setting will use whatever the theme has set it to; if there is no theme default, it will use the WordPress default of left alignment. If you're using the Beaver Builder Theme, the default is left alignment.. You can override the Default setting by choosing Left, Center, or Right. Featured Image (all except Gallery layout) Image Show or hide the post's featured image. Image position Set where the featured image appears relative to post title or post content. Columns and Masonry layout: Above the post title or above the post content. List layout: Above title, above post content (and below post title and post info), left of both title and content, left of post content (image appears under title and post info and left of post content). Image size Which size image from the WordPress Media Library to use. Image spacing Where the spacing occurs depends on the Image position setting. Above title: The number of pixels above, left, and right of the image. The space between the image and the post title is controlled by the Post padding value. Above content: The number of pixels left and right of the image. Left or Left content (List layout only): Spacing between the image and the text to the right. Right or Right content (List layout only): Spacing between the image and the text to the left. Note: As image spacing increases, the image becomes smaller. When the spacing gets larger than the column width, the image will jump larger and become displaced outside the column. For example, if you have a Masonry layout set to 300px, setting the Image spacing to 150px means there is no more room for the image to be sized within the column. The exact number of pixels that causes this to happen depends on the number or width of the columns. When Image position is Left or Left content or Right or Right content the Image width setting determines the width of the column in which the image appears. Note that if Image spacing is >0, the image column width stays the same, but the text column width is reduced by that number of pixels. Show or hide the post author. Show or hide the number of comments. Choose the character that separates the display of author, date, and comments on the same line. The default is the pipe character. (all except Gallery layout) Content Show or hide post content. If set to Yes, the entire post excerpt is displayed, if the post has content in the Excerpt field. If there's no excerpt, the WordPress default of the first 55 words of the post content is displayed, with an ellipsis of three dots at the end to show there is more content. Content length Set a custom number of words in the post content to display (default is 55). This setting has no effect on post excerpts. It applies only when the post has no excerpt and post content is displayed. More link text (Appears if More link is set to Show. Customize the default Read more text. The Gallery layout has a different set of settings and is presented in Table 3. Posts Post background color The color fill of each post border box. Post background opacity The opacity of the background color fill. Post border type The style of border on the post border box: None, solid, dashed, dotted, double lines. If you choose a value other than None, you can also choose a color and width of the border in number of pixels. Text Title color Color of the post title. Title font size Size of the post title font. Post info color Color of the post info (author, date, comments, separator). Note: By default the link color in the Post Info is set by the theme's accent color, if there is one. If you set Post info color, the color of the entire Post Info line is this color, with no distinction between text and links. Post info font size Size of the post info font. Content color Color of post content. Content font size Font size of post content. Sets the color of links in full-text post content. Sets the hover color of links in full-text post content. The following table applies to the Style tab for Gallery layout only. The type of transition when a user mouses over a post in the display: fade, slide up or down, scale up or down. Overlay colors Overlay text color The color of text overlaid on the featured image. Overlay background color The color of the overlay placed on the featured image. This setting is generally used to make the overlay text color more legible. Icons Use icon for posts Choose Yes to display an icon on the line above or below the text. Post icon Select the icon you want to display. Post icon position Above or below the text. The Pagination tab has settings that let you divide a large collection of posts into manageable chunks, as described in the following table. Pagination Posts per page Determines how many posts constitute each chunk. The default is 10 posts. Note: Posts per page does not set the number of columns across the page. That is controlled automatically according settings on the Layout tab and screen width. For example, if the screen size allows 3 posts per row and your Posts per page is set to 5, you will see three posts in the first row and two posts in the second row in the first chunk of posts. Pagination style See below the table for screenshots of these choices. Numbers: The page numbers appear under the posts, and when a different number is clicked, the new chunk of posts replaces the previous chunk of posts. Scroll: Chunks of posts are loaded into subsequent rows on the same page as the user scrolls down. Load more button: Appears under the initial chunk of posts, and when clicked it generates the next chunk of posts. The user must keep clicking to get each next chunk. This setting works better than Scroll when you want your users to have more control over the display, or when network bandwidth is low and you don't want to use resources loading more chunks of posts unless the user really wants to see them. None: No pagination. 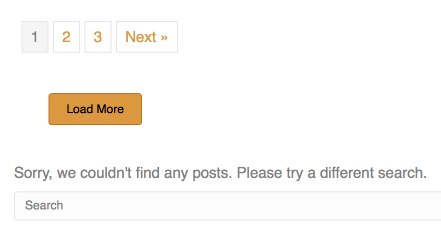 Use this setting when you want to display only a subset of posts. For example, you might want to display only the three most recent posts. No Results message The message displayed when there are no posts to display. Show search Show or hide a search form when no posts are found. See the screenshot below the table. Load more button Button text, etc. This section appears when Pagination style is set to Load more button. It contains the usual style settings for a button. Here's an animated example of the Scroll pagination style. Here's an example of the Numbers and Load more pagination style, plus the search form when Show search is set to Show.